This scientifically-advanced formula is derived from natural ingredients and is designed to assist weight loss by suppression of appetite as part of a kilojoule-controlled eating plan. Helps support a healthy digestive system. Each capsule contains 330mg Chitosan and 110mg Fenugreek. An amino polysaccharide derived from Chitin, which is found in the shells of shellfish such as crab and prawns. Chitosan works by binding lipids (fats) in the stomach to aid elimination. A soluble fibre renowned for its beneficial qualities, forms a gel in the stomach, taking up room, so you are likely to eat less and feel full longer without hunger pains and cravings. How does Chitosan assist weight loss? Chitosan is an indigestible fibre which passes through the digestive system without being absorbed and without contributing any calories. However, a zero calorie count is just the beginning of this amazing story. 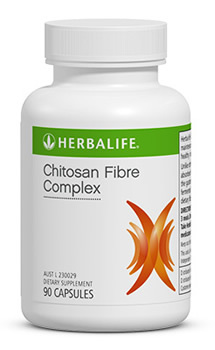 Not only is Chitosan a fibre which contributes no calories, but it actually binds to dietary fats and prevents them from being absorbed by the body and adding to your hips, thighs buttocks or stomach. This is the function that has gained so much interest amongst those trying to lose weight. When you eat food that contains fat, the body finds it easier to store those fats than to use them for body fuel. Fats are also absorbed into the bloodstream and carry cholesterol around the body where it can collect in arteries, veins and around organs, and that's when arterial blockages, heart disease, fatty liver and other serious health problems can occur. The fat bound to Chitosan cannot make its way into the bloodstream or be stored as a fuel source because it forms a 'fat ball' too big to fit through the lining between the digestive tract and the bloodstream. One half to two-thirds of the fat content of a meal can be absorbed by Chitosan - the fat and Chitosan is then eliminated via the bowel.